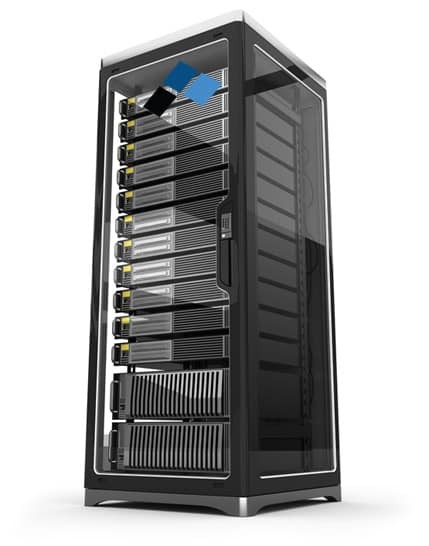 Enterprise-grade network storage made affordable. Introducing LucidFiler, the Network Attached Storage (NAS) appliance with enterprise-class features and performance that brings a dramatic increase in storage affordability. This new type of appliance comes in a pre-configured NAS/SAN ready-to-run server suitable for companies of any size – from SMBs to the Fortune 100, and offers high-performance functionality plus an abundance of features that large enterprises have been spending millions on for years. High-performance features at a fraction of the cost. LucidFiler delivers enterprise-class capabilities such as Hybrid Storage Pools, Unlimited Snapshots with Remote Replication, Inline Deduplication and Thin Provisioning, all powered by the LucidNAS Network Attached Storage (NAS) operating system. The new appliance also offers Self Healing File System that automatically detects and corrects data corruption and RAID-Z that is more secure and more reliable than hardware RAID. Lucid Technology is democratizing enterprise-class storage by making high-performance and extensive feature-set accessible in a cost effective and affordably priced appliance. With LucidFiler, powered by LucidNAS OS, companies can now benefit from increased productivity as well as reduction in both capital and operating costs that come with enterprise-grade capabilities. * Represents time to install, setup, and start using the network appliance. “BrandX” is another well-known NAS solution. “Standard” represents a traditional RAID hardware-based NAS.